The new Formula 430 ASC adds a splash of fishability to a proven performance boat platform. 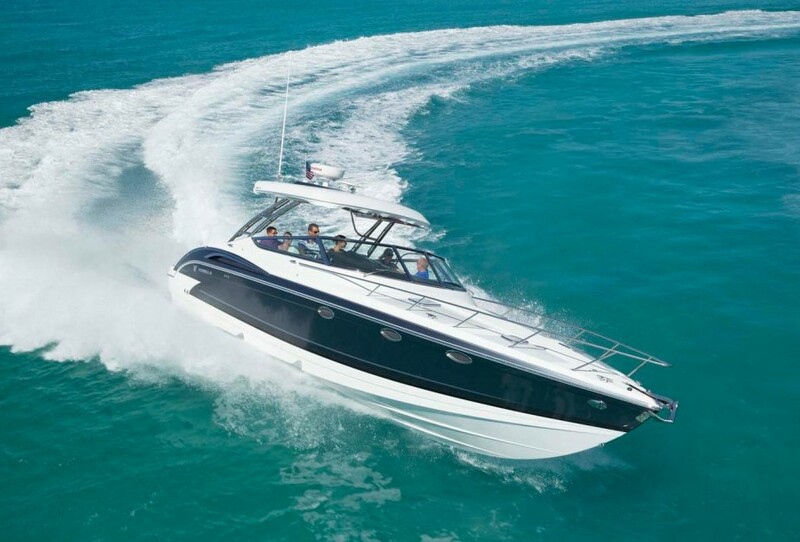 When we discovered the Formula 430 SSC at the 2016 Fort Lauderdale International Boat show we were surprised by its unique nature, but when we came across the 430 ASC at the 2017 show we were simply blow away by its inventiveness. Can a sister-ship model built on the same hullform really be all that different from the original? We say heck yes, and shot this First Look Video so you could take a gander and decide for yourself. As you saw in the video, the bow cockpit remains unchanged. That means you get the same walk-through side-deck to port, which takes you to a lounger with nearly 360-degree seating. A pair of dinette tables raise out of the deck at the press of a button, and can be set to the same height as the seating. Add in the filler cushions, and you have a gunwale-to-gunwale tanning zone. There’s also an optional sunshade available (for use only when the boat isn’t in motion, of course), which shades the entire bow cockpit. Bow arrangement remains the same on the 430 ASC, which means you have gobs of seating that converts into a sunpad. 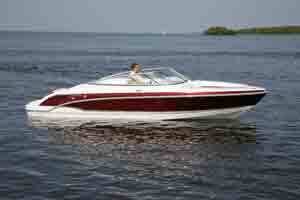 The bridgedeck of the boat is also similar to that of the 430 SSC. The entire area is protected by an expansive hard top, but there’s still plenty of fresh air and sunshine if you want it thanks to a huge sunroof and the swing-open front windshield (which also clears your path to the bow or seals out the wind-blast, as you choose). The helm features a monstrous dash with room for three flush-mounted MFDs, a triple-wide bench seat with swing-down bolsters and arm rests, an L-shaped dinette aft of the helm seat (press a button and the table sinks into the deck), and a fore/aft lounger to port. In front of the lounger there’s a full galley with a sink, an Isotherm pull-out refrigerator, utensil drawers, an optional 240V electric grill, and dedicated blender stowage for your Cuisinart. Things get quite interesting for a bowrider—even though it’s huge for the genre, this boat is still a true bowrider—when you duck through the entryway next to the helm and enter the cabin. Yes, this boat has a cabin. 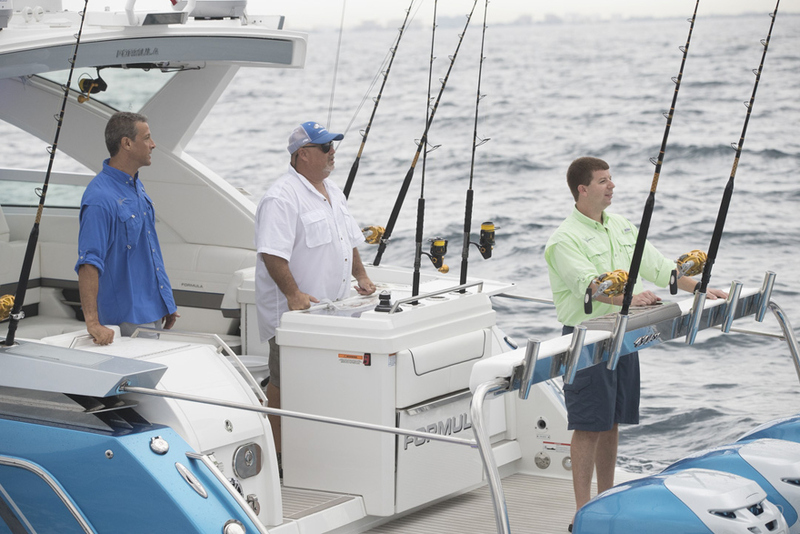 Formula takes a page out of the playbook used by many builders of modern over-sized center console fishing boats in this day and age, by expending the helm console and housing a cabin inside. And this is no bare-bones cuddy. When we stepped inside we were rather shocked by just how much room there was, with a large U-shaped convertible berth/dinette forward, and a full stand-up head to starboard. There’s also a small galley, with a fridge, microwave, sink, and coffee machine. While the serious cooking will take place above-decks, this does give you the flexibility to prep a quick breakfast without ever leaving the cabin. Like we said, when walking down the steps into the cabin we were surprised at how much room we discovered – but that surprise was doubled when we turned around to exit. Because when you turn around and look aft, you suddenly notice that the boat has a second berth carved out under the helm-deck. True, it’s sitting-headroom only. 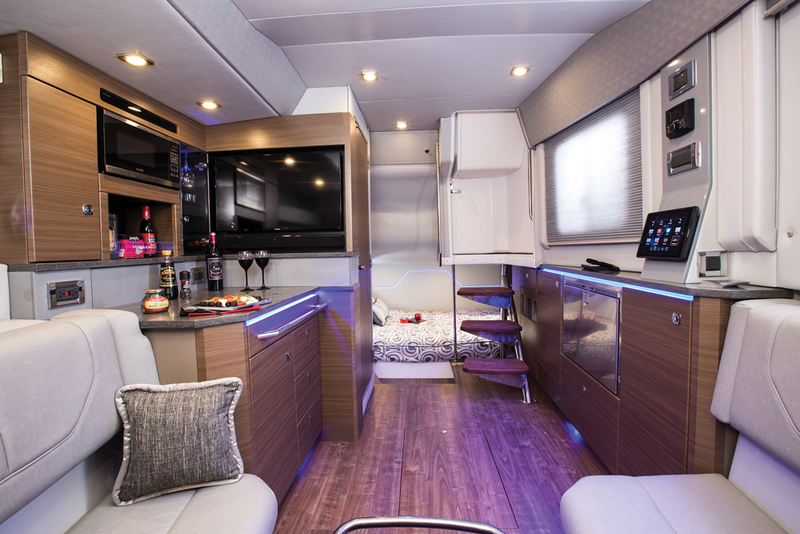 But it’s a substantial berth with an LCD TV mounted at the end, stereo speakers, and hullside ports on either side. Considering just how expansive the cabin is, there’s no doubt that this bowrider is also capable of acting as a serious cruiser. But the boat’s split-personality continues to divide when you stretch out on that aft berth, and look up. You’ll see something here that logarithmically increases both the boat’s surprise-factor and its versatility: fishing rod racks. The 430 ASC’s cabin is shockingly substantial and cavernous—and has several surprises in store. You won’t find many Formulas of any type which have rod racks over the berth, and this is certainly the first to transform the cockpit and its huge extended swim platform into a fish-fighting arena. 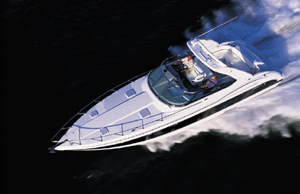 Yes, the 430 ASC is also a fishing boat of sorts. Utilizing it’s over-sized swim platform for fishing space is the key to making the boat fishable, without sacrificing the helm-deck and cockpit design. Formula created a “Sport Station,” which is like a reverse leaning post. It caps off the transom with a line of six stainless-steel rodholders, also has cupholders, and is padded so you can lean up against it whether you’re waiting for a bite or battling with Bubba. Clip-in stainless-steel sliding safety rails cover the sides, so it’s safe to walk out on the swim platform and essentially utilize it as a second aft cockpit even when you’re trolling or drift fishing. The cockpit forward of the platform is tweaked a bit to please the angler in you, and incorporates a 52-gallon pressurized livewell that can do double-duty as a rack for up to four dive tanks. A flip-down aft facing seat is incorporated into its back, and forward of the livewell there’s a tackle station including multiple tackle drawers, five-gallon bucket stowage, and tool holders. Under the port-side cockpit seat, there’s a 75-gallon fishbox that can be fitted with refrigerator/freezer coils and a digitally-controlled thermostat. While it may not be the first choice of die-hard anglers, the aft configuration of the 430 ASC should work out just fine for the fishermen in the family. 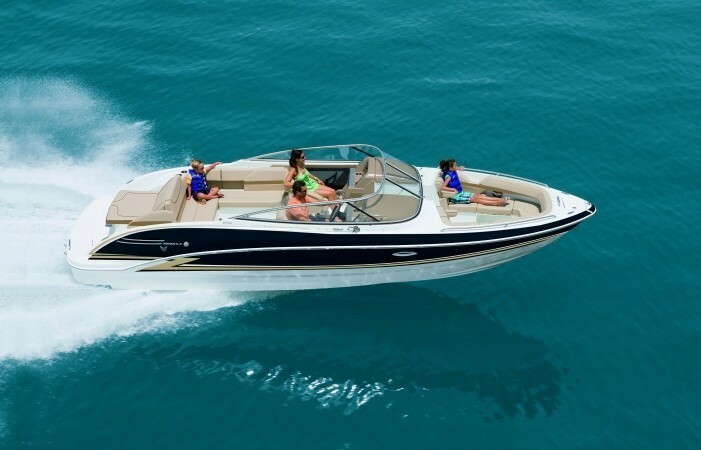 Despite all these fishy features, however, this is still a Formula—so it’s no shocker to discover a brace of quadruple Mercury Verados on the transom. The stock boat comes with 300s, but we’d bet money that most of the 430 ASCs leaving the factory will sport the optional 400R or 350 Verado outboards. 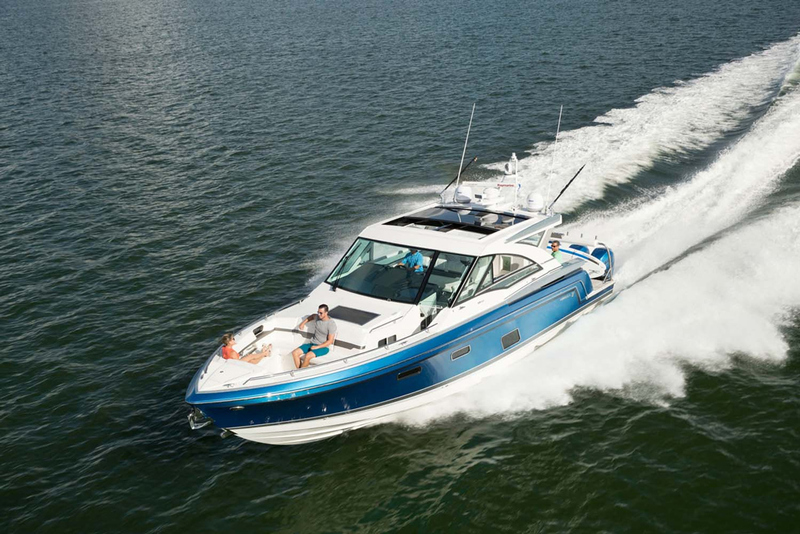 Plant all of the maximum 1,600 horses on the transom of this twin-stepped, 21-degree transom deadrise deep-V hull, and you can look for cruising speeds in the slightly-over 40 MPH range and a top-end breaking the 60 MPH barrier. 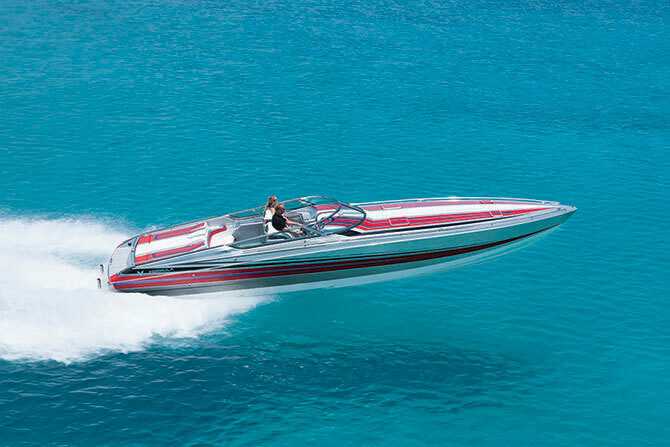 With performance numbers like that, the Formula 430 ASC makes the cut as a speed boat. Yet with its aft cockpit and swim platform design, we already know that this model also qualifies as a fishing boat. And thanks to that expansive cabin it’s an express cruiser as well. Yet one look at the bow cockpit leaves no doubt that the Formula 430 ASC is really a bowrider. The bottom line? 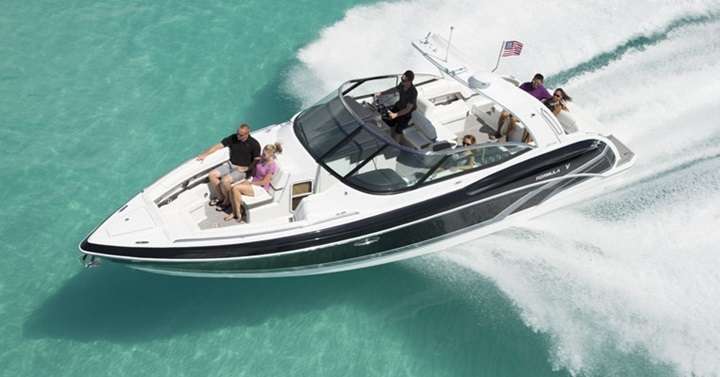 This boat earns the “All Sport Crossover” moniker Formula has bestowed up it, with an inventive attitude that can’t be topped. It’s truly all of the above. 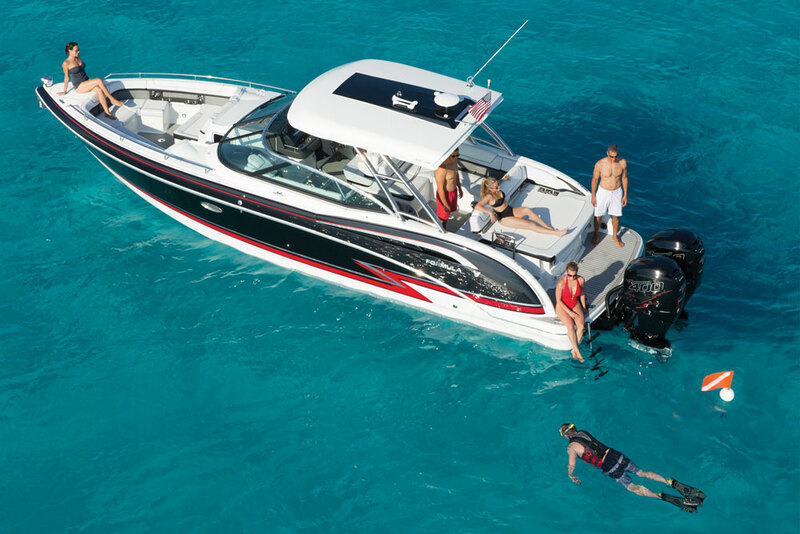 Other Choices: If the fishing angle isn’t of concern and you prefer stern drives to outboards, the Sea Ray SLX 400 might be of interest. If you want the emphasis on speed and you’re willing to give up such a copious cabin, check out the Nor-Tech 450 Sport Center Console. And if you want a fishier angle to work with, the Boston Whaler 420 Outrage will be in contention. See Formula 430 ASC listings.